Would you support substantially raising the cost of a Transfer Station sticker? Or reducing the hours of operation? How about an extra fee for disposal of bulky items like refrigerators? Or doing away with the provision that allows seniors to use the Transfer Station for free? What about a use-based model that would charge you by the bag or by the visit? All of those options and more were on the table last night as the Board of Selectmen discussed how to lower costs and fund operations at the Transfer Station. The discussion lasted more than an hour, but in the end there was little consensus on how to move forward. Rooney warned voters at Town Meeting last month the town is headed for a Proposition 2-1/2 override vote within the next few years unless significant changes are made to town operations. At last night’s meeting the issue was the $535K it costs every year (based on 2012 numbers) for the town to dispose of its trash. 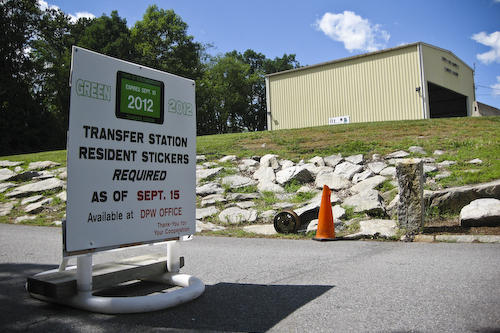 DPW Superintendent Karen Galligan said 66% of that cost was covered in 2012 by the sale of Transfer Station stickers at $175 each. The rest was funded by your tax dollars. Therein lies part of the debate. Selectmen Dan Kolenda and John Rooney argue the Transfer Station should be self-funding and not rely on tax dollars to operate, although they strongly disagree on how that should be accomplished. Selectman Bill Boland, on the other hand, believes it is appropriate to use tax money to help subsidize trash disposal. While Boland would prefer to see things remain largely the same, with perhaps a modest increase in the sticker price this year, both Kolenda and Rooney want changes. Kolenda said he would like to raise the cost of a Transfer Station sticker so that the revenue generated would fully fund operations. Galligan said doing so would bring the annual cost of a sticker to $259. Rooney, who opposes increasing the sticker price, has long advocated a use-based model like pay as you throw. He told his fellow selectmen he would not support any plan that did not encourage recycling and reduce the amount of trash thrown into the hopper each year. Both Kolenda and Rooney said they would support shortening the hours the Transfer Station is open as a way to reduce expenses. The Transfer Station is currently open four days a week for ten hours each day. Galligan said cutting back to three 8-hour days would save the town about $44K annually. It would also allow the DPW to more efficiently distribute its staff across its various divisions. The board asked Galligan to present options for reduced hours at its meeting in June, but one proposal discussed last night called for the Transfer Station to be open Tuesdays, Thursdays, and Saturdays from either 8:00 am to 4:00 pm or 10:00 am to 6:00 pm. Boland told the board he would be hard-pressed to vote for reduced hours, saying the town has tried that in the past and it didn’t work for residents, but Galligan said she believes most residents would be fine with the change. “The quiet majority aren’t necessarily going to be bothered by [reduced hours], and it could free up money for other services,” she said. At its next meeting on June 4, the board will consider the proposal to reduce hours. They’ll also look at imposing an additional fee for disposal of bulky items and charging seniors a percentage (10 – 25%) of the sticker fee. You can find more detail on all of these options in the analysis of Transfer Station operations that was presented to selectmen at last night’s meeting. What do you think? Given the town’s fiscal situation, would you support any of the changes discussed by selectmen? Share your thoughts in the comments below. Selectmen also invite residents to send their thoughts via email to selectmen@southboroughma.com. No curbside – too many aesthetic reasons against it. Was it brought up just for comparison or is there some serious support anywhere? I could see paying more per year as long as it wasn’t going to build more sheds or install cameras. Take any good pics lately that could justify that expense or was it just for show? PAYT could be nice except for how you handle donations. Karen wants the “shed” gone but most of us are OK with it. Slides 4 and 5 show increased operating costs even though we are lower our trash levels. Perhaps cutting back hours could be effective if they were half days here and there – every other week has a half day Thursday. Costs of disposal rise so how about charging a 5% increase in the permit annually until it’s in line with actual costs. That way it’s all covered long before anyone has to make an all or nothing decision. Also you could require that all trash be contained in the $1.75 bags but sell them for their actual cost just to get people moving in the right direction. This is a good start. Keep talking and keep us in the loop. We already have curbside pick up. Many people in town choose to pay for private haulers. There are at least 2 companies that operate on my street. Nothing we do with the transfer station will change that. The reality is that very little that the BOS can do will really effect our tax rates or a potential Prop 2.5 override. 2/3 of our budget is spent by the 2 School Committees. If we want to avoid/delay a prop 2.5 override we need to focus on our shrinking k-8 school population and closing a school. There are millions of dollars at stake. Nothing else really matters. To be more precise…No Townwide town sponsored curbside pickup. I have a few on my street too and I don’t need any more big barrels two feet into the road. I wonder if the shrinking school population relates to the shrinking volume of trash we are disposing of? Maybe we can talk about that all summer. Al – If that is the answer then it must be the question that eludes the BOS. Any chance they will choose the RED pill? The plain fact is that the BOS have no say in our School Budgets. The School Committees are independent. The decision to close a school can only be made by the K-8 School Committee. Once it is made and the building is declared surplus to their needs by the K-8 School Committee then the building reverts to the BOS control. There are several million dollars on the table. There is no reason to even consider a Prop 2.5 override until we take this step. Is this why we needed the TA to take over the roles of the selectman, so that they can discuss the same issues over and over and over again?? Just like we decided last year. The majority of residents like it the way it is!!! Why are the selectman not considering a tiered fee system that would charge commercial stickers a higher fee than residential stickers? It would be interesting to see what the split is currently of commercial vs non commercial. There are currently plenty of commercial users of the transfer station who regularly dispose of non residential refuse in the hopper that leads to increased costs for all residents. How about we charge a fee for commercial use that is 2x-4x that of a residential sticker? Keep the current sticker price, or even a modest increase, for the residents and have the commercial users pay a higher fee due to the increased dumping. While it most likely would not cover the cost differential completely, it could certainly offset a potentially significant portion of the current deficit in a fair and equitable manner. If we were to then combine this set up with a PAYT system, we could potentially leverage the reduction in the amount of refuse deposited in the hopper as contractors etc would be unlikely to pay the additional fee for their construction/renovation waste. Station Costs: -287,529 (of which, $212,000 is personnel). As the Transfer Station is open only part-time, and the town residents provide all the labor of actually transporting and disposing trash and recycleables, why is the personnel expense so high? How many FTE are assigned to the Transfer Station? Page 10 seems to indicate that the answer is 1. Is that true? $212,000 in total personnel cost for 1 FTE? Good point Tim. Though I believe there are actually 2 TE’s at the TS currently but still see no justification for a $106,000 salary either. There are many areas of our town’s budget that need to be analyzed/scrutinized before even a hint of Prop 2 1/2 should be presented. And I do believe wholeheartedly that the TE salaries need to be included in that scrutiny. There are employees in all fields that have had to make the difficult choice of reduced salary or unemployment and with the impending fiscal fiasco we’re coming upon I don’t think that’s unrealistic at all. If we shorten our hours, my vote is for Friday-Sunday! Just close it down already. Hire a contractor to do the job for the town. One afternoon per week with trash barrels out won’t hurt anybody. Or, people can have have private companies to do it for them. Its a total waste of space and money to operate an entire TS! I agree with you Rob. Multiple people on my street already pay for private haulers, I see no harm in making life A LOT easier on all of us by simply hiring a contractor to collect the trash. This is how so many towns already do it. Personally I find it inconvenient to go to the TS weekly. My wife sure isn’t volunteering to haul the trash so I say do away with the whole thing. I would be fine with a sticker cost of $200 if they would be open fri-sun for three 10 hour days. There, you’ve made more money, AND reduced the cost. Make commercial users pay (a significant amount) more. I always see them dumping non-household waste. Why are seniors paying such egregiously low permit fees in the first place? I think tax revenue covering some of the TS makes sense. I imagine most people who choose to get private pickup are wealthy and don’t want to drive their own trash to the TS, so they probably don’t even notice the extra 50 bucks they pay in taxes to subsidize the TS. In fact, you could even just roll the whole cost of the TS into our taxes and not have a permit cost at all. This is how every other service the town provides works, whether you use it or not, like the library, or schools (people without children like myself). And is saving this ~200k deficit (not even a deficit, since taxes are covering it) really our biggest problem that officials should be talking about right now? I’m sure there is much more bloat elsewhere, and the TS actually provides a useful service. Like another poster said, we are going to hit an override due to education costs whether this paltry TS budget is modified or not. I don’t think the savings are worth further inconvenience to residents. I agree with your days of operation wholeheartedly. The TS should be open Fri-Say-Sun. Agree. The transfer station is a convenient target. Charge a little more if you must, especially for commercial use, but please spare me the PAYT. Why are we spending so much time discussing the TS instead of the elephant in the room which is the school budget? Because they pay egregiously high property taxes to pay for our egregiously high school costs. I have no problem that our seniors get a break and I am thankful for their support. I am a young single homeowner and I am paying those same egregiously high property taxes for our egregiously high school costs. Why is MY sticker $175? Everyone should be charged the same amount. Except maybe commercial, since they are currently taking advantage of the system. I have been in the town just long enough to have been through a few TM votes. One in the early part of the last decade stands out in my mind. It started off with an emergency vote for additional funds for the school system. Being new to TM, what startled me was a good many seniors were present and the warrant carried unanimously. Not a negative comment made. So, I have no problem with them getting a break. They probably have lived here a long time and have made the town what it is today. The crux of the problem is the school budget. The transfer station budget is mere pocket change in comparison. I would be willing to bet that what we pay for school bus transportation could pay the TS costs – and make if free for all. So, lets see – Go to a system that reduces the amount of trash we send off, increases recycling and reduces overall cost, or stay with the way things are AND pay more. Kind of a no brainer. Let it out to bid for a private contractor to run it. Transfer station a red herring. Just a waste of time discussing it. The money is in the schools and the unions that are bleeding us dry. There is nothing else material to debate, in my opinion. Trash collection or disposal via the transfer station should be a town service paid for by real estate taxes. I have asked this question before but haven’t received an answer to it. Clearly other towns transfer stations are run at profit Weston,Wellesley I believe have everything separated such as glass bottles in different colors for example and is run by a full time staff. Now; Questions I have are why hasn’t this model been utilized in our town and why hasn’t this been discussed yet? Also the steel bin is a money maker since at last check scrap metal was from 280-300 dollars a ton. I for one know there’s a lot of collected scrap in our town. Those Lawnmowers and patio furniture sets pile up. Cardboard this is a commodity since other countries buy American trash and recycle it. Are we getting the most money back from our trash? How can these other towns make money on trash and provide full time staff and still run with budget surplus ? Clearly something is wrong with our town or maybe haven’t seen the trees for the forest. I had asked this same question when purchasing a new dump sticker and the reply was “That’ll never happen here”. When money gets tight then the hard questions will need to get answered. Furthermore I too have seen the commercial contractors dumping drywall and construction debris into the compactor from jobs that clearly they should of taken care of on site. Also on many occasions people come and make no attempt to separate the items that could of gone into the swap shop or one of the dumpsters other than the hopper. The main thing I see is Cardboard.! It affects us all. The failure to recycle will just cost us more money if not run properly. One more thing; I don’t understand is initially the swap shop was going to close due to the lack of funds. Now there are three buildings there built by the Assabet crew for what reason? The simple and the complicated answer I think is Miss Gallagin. She doesn’t believe that any $$ generated from the metals is of any significance and would never ‘stretch her staff any thinner’ by assigning a F/T person to the TS who’s job duties should actually include securing revenue from the non-refuse trash that is collected there. (while they’re 50% of the time just standing there watching the hopper and getting paid 3 times what many nowadays makes). I do believe she is just completely out of touch with the residents of this town and that was made apparent to me during the ‘SwapShop fiasco/debate’. If she thinks the majority of residents wouldn’t care if the hours were cut I feel she is sorely mistaken (AGAIN). Many residents who have curbside service do so because of the lack of reasonable working TS hours now. The schedule she presented and was pushing for was completely backwards. A Fri-Sat-Sun schedule and she’d see really quickly how many more residents would utilize the TS. My teenage goes to the TS weekly for our house because my wife and my self work during all open TS hours like many other residents. The seniors should not have to pay anything for a TS (except that many many children of these seniors take advantage of that benefit, we all know they do). I would gladly pay $325/yr for curbside if it meant that this whole TS/SwapShop situation was no longer the focus and we got to topics that are going to have serious consequence in the near future!! But I do not believe a raise in fee without a raise in service is appropriate. At least tell us that you’re trying to find ways to offset this TS ‘deficit’ but investigating town TS plans that actually work. There are ways to profit, reduce refuse, and lessin any addition fee or tax burden if the TS wasn’t viewed by those in charge as ‘the problem child’ it could probably happen sooner rather then later. Try googling “how to run a town transfer station at a profit”. Some very interesting articles that show we have a common problem and that there are demonstrated solutions available. How many signatures do I need to force whoever is in charge to require commercial contractors to dump elsewhere or for a MUCH higher fee? WE HAVE KNOWN THIS IS A PROBLEM FOR YEARS!!!! Why are scapers allowed to take metal from the TS and effectively steal over $250 a tonne from the town? Last year I talked to a person who told me he borrowed his bosses pick up all summer and loaded it up with aluminum so it could be shipped to mexico. I asked him how it could be profitable and he said that it’s easy since he gets it for free. Are those cameras doing anything? Are those sheds going to help make the TS more efficient, it just looks like more buildings to maintain? Oh and it’s time to close a school and sell it to an entity that will PAY TAXES!!! If you want to sponsor a by law on this subject you can do it one of 2 ways. By gathering 10 signatures it must appear on the warrant for the annual town meeting or you can force a special town meeting by raising 200 signatures or 20% of the registered voters whichever is less. You also have the right to ask for the records of the sale of scrap metal and paper from the recycling center by making a freedom of information request. We have been over this ground very recently. It is abundantly clear that PAYT is overwhelmingly opposed. And as for the concept that town services need to pay for themselves, maybe we should charge a processing fee for every arrest and increase parking and speeding ticket fines to pay for the police or maybe charge a homeowner a few grand whenever the fire department comes to put out a fire on their property. How about different snow plowing fees for those who live on sparsely populated streets vs those who live on densely populated ones? All to avoid a Prop 2 1/2 override that might show up in a few years! As John and Christopher said above, the TS should simply be another service provided by the town to its citizens. Matthew; If someone is taking scrap from the transfer station, isn’t that theft? Are you saying they were allowed to take scrap metal, or are you saying they did it without authorization? This particular guy was loading a pickup with gutters, patios furniture, storm windows, anything aluminum. I have no idea if he was permitted or was stealing. Was I stealing? I would have pay by the pound if that was available – the $500 grill would have cost me $23! It’s worth more to me in it’s original form, isn’t that the best kind of recycling? And if TE doing their job while at the TS then it would be really easy to separate the 2. ‘Scrap metal’ drop for town to profit and ‘Maintenance needed’ drop for people to utilize as such. I don’t see why the TS has become so cumbersome and such a physical and financial burden that it couldn’t be brought to an efficient level. How much per ton do we get for scrap metal do we get, how much per ton do we get for recycled paper, glass, etc. I would be willing to pay a little more for sticker and have no desire to be buying special bags to dispose items. This would be one more thing to get in the way of doing a task I hate to do to begin with. I also don’t want to wait in lines at the transfer station for people to look at what I am throwing out to decide how much. No Thanks! The sticker fee isn’t deductible on income taxes; property taxes are. This becomes more and more significant at the (proposed) fees soar. If people opt-out of the transfer station for curbside pickup, that’s their choice. I wouldn’t object to providing them a rebate at the end of the year based on proof of payment for their choice – IF that doesn’t compromise the ability to deduct the rebate amount from taxes for the rest of us. PAYT – this sounds attractive – until you experience it. As someone who visits the transfer station once every 3-4 weeks, disposes of 1 grocery bag in the compactor, and a couple of bags of recyclables – $52 vs. $260 seems attractive. Of course, all the full-service supermarkets are in other towns. A fair number of people I know use markets in Framingham, westborough, northboro, marlborough. How many of those markets will carry bags for the small volume that Southborough would drive? And do they mark them up? Or does the town pay the market? And that doesn’t cover people who work elsewhere and shop there. Buy bags at the transfer station? What hours? How much more staff? What’s the inventory cost? PAYT exists at a summer place (in MASS) in my family. The hassle of bags and reduced hours means that the family would rather drive for 3 hours with garbage in the car at the end of each stay to (another town) for disposal. Reduced hours is hardly a panacea. If you study the presentation, it would make a difference of $18/sticker, or $0.35/week. Trash disposal is a basic town service. Yes, we need to do a better job of educating people about recycling. How about teaching it in the schools? Offer recycle separator bins at cost at the transfer station? Weigh recyclables and record per-sticker. Lottery among the top 25% of recyclers and give away a restaurant gift certificate every month? Be creative. But the current scheme, where most people lose the ability to deduct the cost from their taxes so that a few who use private haulers aren’t annoyed is not equitable. I’m not annoyed about paying for the schools for over 25 years, although I have no children. It’s part of a free society – and I’d rather pay to make the them productive *VOTING* members of society than to build prisons. Put the transfer station costs back in the DPW budget. Do the education for recycling. And as others have noted, focus on the big items in the town budget. I agree with Ed–no thanks, for PAYT–it would cost more than it would save because a greater number would hire a contract co to pick up their trash so we’d not meet our hauling rate. Charge a little more for the stickers if you must but definitely find a way to be more efficient with the personnel costs–maybe hire more seniors for tax benefits. Also a decrease in hours is not acceptable. A change in hours to more days–especially Mondays during the summer–and staggered hours other days would be acceptable. M & T & W could be 9-3 (or 8-2), Th & F could be 12-6, and Sat 8-6–still 40 hrs. Be creative in a positive way DPW instead of trying to decrease service and you’ll make more people happy. Again, the transfer station is a diversion. The issue is the schools and the unions. That is where the money is. BTW, I’m against including the expense in the property tax for federal tax purposes. For a number of reasons. In any event, it’s not material and for me a dead horse. What does reducing the hours or days the transfer station is open have to do with the amount of trash disposed of? Residents generate “x” amount of trash. If the transfer station is open one day or seven the same amount of trash is disposed of. The issue is cost. The transfer station should be considered a town service such as police, fire ,DPW . As such it should be included in our real estate taxes. The cost of the transfer station would be shared by all residents, users or non- users. We should be willing to pay for monitoring the users of the transfer station. I’m sure everyone has experienced obvious non- residents taking advantage of our open transfer station. I’d like to know why the cost of running the operation exceeds the cost of disposing the trash. The libertarian in my says that Govt should only provide a good or service if there is a failure by the private sector to provide that good or service on a competitive basis or an external benefit that is not being captured. Trash disposal does not meet this standard, there is a competitive private market for trash and recycling services. Barring privatization it seems to me that it would be desirable to have some sort of scheme where those that created the most waste paid more than than those that create less. However, the political reality is that there is no substantial constituency for either closing the transfer station or PAYT. If put on the floor of Town Meeting proposals to do either would fail by a large margin. That leaves to Fee or Not to Fee. I find the deduct-ability argument flawed. Trash services are just another thing we have to secure to live. We do not get to deduct the food we buy, the gas we buy, the appliances we buy why should trash be so special. If the town is going to offer trash services and compete with tax paying private haulers (who should be miffed that some portion of their taxes are being use to limit their economic opportunity) then at a minimum it should stand on its own financially so that consumers have a fair choice and we treat tax paying haulers fairly. Al, you pose the question why is trash special. I’ve always viewed that trash is special, simply due to litter and other environmental concerns. Trash removal isn’t just another thing we *have* to secure to live, there are too many ways in which people will cheat the system, by burning, burying, hording, littering, or stealing (throwing in others’ dumpsters). I believe it is better to come together as a community and force everyone to secure trash removal by paying through their property taxes so that we avoid the above. I also believe that the “bulk” discount received by everyone paying for the same service should work out to be cheaper than the free market. As for the proposals in the presentation, I’d like to see what the curbside contract would cost without the 1 bulky/month. Bulky items should need stickers. I’ve heard of towns with every other week pickup on recycling too. And would we really need brush removal? Could we cut it to three weeks each, or could we keep that at the transfer station for less? I think we could manage a best of both worlds with curbside and transfer station. A discount curbside contract with no bulky (possible even a one can limit), no brush, and biweekly recycling combined with a Saturday only TS. Planned right this should/could come out to about the same overall cost but even if it cost a little more I’d happily pay 250 for that sticker. Lastly, I don’t like pay as you throw because it encourages the behaviors I mentioned above. I really don’t believe that it encourages people to throw away less anyway, we generate the trash we generate. The savings found in the towns with pay-as-you-throw are most likely from eliminating the abusers (contractors) and for that there has to be a better way, but I’m not sure what that is. I do not think trash is special. I grew up in a community that was served by private haulers and we were not drowning in litter. The haulers did use a landfill run by the county. There are lots of places where private haulers are the rule and govt is not involved. As for the argument that we should come together as a community to force everyone to use a service that the government chooses for you, I think you can guess where I will be going with this. Having a state monopoly provider (Milton Friedmans words not mine) effectively remove peoples ability to decide what is best for themselves. It limits our free choice. There are times where this may be necessary but trash services is not one. Forcing people to use a service the state selects for them when there is an effective free market alternative is an abuse of power from where I sit. Finally, I am eternally skeptical that the current system we have is cheaper than private haulers let alone private haulers hired by the government. I use a private hauler (I also have a dump sticker). I pay a bit over $400 per year. The transfer station on a full cost basis runs over $250/year. However, in any fair comparison you would have to add the cost that each user incurs in their weekly trip. At $0.50/mile and an average round trip of 5 miles that is $2.50/week or $125 per year. Add in the value of personal time and you are behind on a cost benefit basis. Of course we should also count the 100’s of trips per week adding to traffic congestion, air pollution and green house gas emissions and the current system does not look so good on a cost benefit basis. If the town were to contract for the service it would have to jump through a myriad of State rules that are designed to prevent fraud and abuse as well as encourage unions. Having seen a few public construction project the end result for the tax payer is not pretty. This is of course all academic. There is no constituency in town that wants to take on this fight (present company included). It is a side show. The only reason why it comes up is that the BOS is concerned about taxes and they have to prioritize what services will be paid for with our tax dollars. The BOS only controls about 25% or so of our budget and that part is being squeezed hard by our fiscal constraints and our inability to reign in the spiraling costs of the rest of govt so they are asking how to trim the parts of govt they have under their control. I’m trying to understand, in your first paragraph, your clause “government is not involved.” Do you mean that government is not involved in choosing the private hauler, or government is not involved in the disposal of waste? I first thought of the latter, which is not true if the county runs the landfill, but then I thought of the former, which seems true in your example. I ask specifically because I feel trash disposal is a common good that government should be somewhat involved in (but not to the exclusion of allowing citizens to choose a hauler, for instance), and I am trying to understand your position on that. Sorry if I was not clear. A private company, that my parents got to choose, came to our house and picked up our trash. I believe that most of the private companies that picked up trash in our county used a landfill that was operated by the county. In Southborough, the trash that is dumped in the pit at the transfer station is hauled by the town to a private company that incinerates it. If you use a private hauler in Southborough government is not involved at all in your trash disposal. QED there is a perfectly responsible way to dispose of your trash (and recycle) that does not require the government to provide any service at all. So, the question remains, if there is a perfectly responsible private (tax paying) sector that provides the service why should someone who uses a private hauler subsidize someone that uses the transfer station. There is an important role for government to play. The responsible disposal of trash falls under the broad heading of public health and I do believe that protecting public health from disease and pollution is a legitimate role for government. We should have rules about what constitutes responsible disposal of trash but beyond that the govt should but out as long as the rules are followed. Like you I am perfectly willing to tell a widow living on a fixed income that she must pay a substantial sum to educate the children of our town and that she cannot burn trash in her back yard (this used to be a common practice). However, it is a mistake to couple the social good (eg an educated populace or cleaner air and water) with the institutions that may be set up to deliver them. I am all in favor of educating the children of our community to a high standard and am willing to pay my share. The challenge is to separate the institutions we set up to deliver the good from the good itself. There are alternative models of how the public can provide universal education that appear to be more effective and less expensive than the traditional public schools. Charter schools and voucher programs are examples of these alternatives. However, we have well entrenched institutions that will fight these potentially more effective ways of achieving the public good tooth and nail. Both the school systems and their associated unions are more focused on self preservation than they are on delivering the social good at a reasonable cost. They will attempt to suggest that the institution is the public good rather than just one of several ways to deliver the public good. This is classic institutional behavior. The same applies to trash. It is the spring of 2015 and it is clear that the status quo in town govt will require a prop 2.5 override. You are the BOS. What “essential” service do you place on the block if the override does not pass. (Please don’t wimp out and say we cut everything, some services are more vital and difficult to replace than others). I think, viewed in this light the Transfer Station is a good candidate. There are acceptable alternatives in the form of private haulers. It is hard to say the same for roads or the police. There are alternatives when it comes to other emergency services (like ambulances) but fire services would also be difficult to replace. Depends what you’re after. If you just want to balance the Town’s budget, then cutting services will work. But that just shifts the costs onto the residents in another fashion (private fees vs. taxes). None of that will help seniors stay in their homes. What the town needs is true cost cutting, and the BOS is not the committee to make the decisions that will actually impact the bottom line. This remains all about the schools and what we are going to do about them. Until that is faced up to, the pain and this conversation will continue without resolution. Well, if you want to talk about the evils/role of government: let’s remember that before government took over Police and Fire, you paid a private service. Police? There are lots of private security companies, many of whom pay a lot less. Maybe I won’t pay one – but once the burglars are in the neighborhood, they’ll probably hit your house too. And yes, this too happens in other parts of this country. Roads? In colonial america, many roads were private Toll roads, as were bridges and river crossings. So they too could be replaced. And there are some bizarre experiments in that going on now where private industry is paying for highways in exchange for the right to collect tolls. So let’s no write that off either. How about privatizing main street (the part that isn’t a state road)? There’s room for 3 or 4 toll booths, or a clever entrepreneur could probably make a deal to accept Fast Pass. After all, there are some roads in town that I’ve never been on in 25 years, so maybe I shouldn’t pay for them. And let’s not forget water. We could go back to private wells, or sell the water business. Just ask a few cities in Europe about their experiences with privatizing water and sewer – at the behest of some wall street banks. We could live these unincorporated areas, but we choose to live here. The prop 2.5 argument is a false choice. Somewhere we seem to have lost track of how OUR government is supposed to work. Here, we expect certain baseline services for the common good. If you disagree about what the baseline is, Town Meeting (and the prep meetings leading up to it) is the place to discuss it. And how to pay for it. You’re certainly not shy. Legislating by the BOS imposing service changes and fees, AFTER Town Meeting has spoken and absent a prop 2.5 revolt is NOT how this town is supposed to operate. When and if a prop 2.5 revolt happens, the actions to be taken are determined by the Town Meeting article that put an issue on the ballot. If you think the wrong service is put on the ballot, amend the article at Town Meeting. If we have an unanticipated emergency, then the BOS, with the consent of the Advisory Committee gets to handle it. Until the next Town Meeting. What’s happening here is that the BOS is tinkering with services AFTER Town Meeting has spoken. And there’s no emergency. I would not mind paying more for my sticker. I do believe trash disposal is a public good and therefore a reasonable thing to expend tax dollars on. What I’m really not OK with is losing my flexibility to dispose of trash twice in one week, once in another, and sometimes not at all. Unless that disposal company is going to come around at my convenience, I want none of it. I have a relatively recent experience of trash vehicles stopping very near my house, and the noise bothers me. This is no good reason for me to oppose my neighbors’ use of the service, but the idea of the truck stopping at every house, engine idling, and then roaring to the next house is enough for me personally to oppose a town-sponsored trash collection service. Not to mention, when we moved in years ago, on trash-truck day, there was usually litter in our yard. That, fortunately, is not the case with the current truck. I would like to know how other nearby towns do this? What is their cost structure for a TS? Do they also have $200k+ in staffing costs? I have to believe some other town has cracked the code on having a TS that breaks even. I don’t have trash pickup but the trash truck comes up my street once a week and is gone in minutes. Landscapers, on the other hand, drone on for hours. They both provide needed services, but I find the latter way more intrusive. Trixie, as a “do it yourself” lawn-care guy, I feel like my neighbors put up with ME. A service is a much shorter disruption…many hands make quicker work…but we’re heading off course here. Framingham has trash pickup. It ‘s included in their tax rate. Why can’t Southborough do the same? Yes, Framingham and Marlborough both have curbside pickup. What is Northborough doing these days? I don’t have an issue with bringing my trash to the Transfer Station, however if someone comes up with a money saving alternative, I would be willing to give up my once a week social life to test something else. But it would need to be a real money saver, not smoke and mirrors. I believe Northborough has pay as you throw. I believe Northborough has weekly curbside trash pickup but you have to buy the bags and use only those bags. They also have recycle pickup but I think that is every other week. Don’t know what happens if you have an over sized article that doesn’t fit in a bag. Read many of the comments given on the TS changes. I am so pleased to see that so many feel as I do, that the TS should be suported by our tax dollars. It is such a great service to the towns people. I hope you can attend the BOS meeting Tuesday, June 4th at 7:00 PM, when they are going to discuss the future of the TS. Here is the best opportunity for you to express your opinion. Suggest you read the proposal to be voted on by the selectmen on Tues 4-Jun. Beyond the sticker price increase, it includes a number of fees for things that are currently included in the sticker cost. And some really obscure rules – getting rid of an old carpet? It must be cut into squares no more than 2 ft square, and it MUST be in a barrel? And you pay by the barrel. Don’t have a barrel? I guess you get to buy one. Buy your permit in person, or after 15-Sep (no matter when you first use it)? Pay $25 more. (Or if a senior, $10). Putting something in the swap shop? You may pay a fee. If it’s open…to be closed Oct-April. Hours? Tues, Fri and Sat only. I strongly suggest going back to no fee for everyone, or at worst, no fees on top of the sticker’s cost. The town should be focused on what’s really driving costs. The budget is primarily schools; increases are health care and unfunded retirement obligations. The town budget (excluding capital and other items funded by special warrant articles) is about $47.3M. This issue is (literally) in the rounding error. Fred, the proposal says FRONT WINDOW, not windshield. With that, I am assuming the driver’s side front window. And with a new rule prohibiting removing scrap from the metal bin, who will enforce this? The DPW workers have enough going on, and I don’t see where they will be able to enforce. I see more problems and spitting contests coming up at the Transfer Station. Thanks Fred, I did not know of these unbelievable ideas. I would like to know who is coming up with these ideas. It’s like they are trying to destroy our TS. Hope to see many at the BOS meeting Tuesday. Per the cover memo at the link posted previously, Karen Galligan (DPW Superintendent) is the one “coming up with these ideas”, at the direction of the BOS (Board of Selectman). The Transfer Station is operated by the DPW. These aren’t just “ideas”. They come from a *proposal* that the BOS is expected to ratify on Tuesday. I’m sure that Ms. Galligan’s intentions were pure. If one follows the themes of “let users pay for the services they consume” and “make the transfer station self-supporting”, these ideas are quite consistent. Some might see them as moving toward “Pay as You Throw” on the installment plan, under another name. But don’t pick on Ms. Galligan. She is an excellent public servant. She did what she was told to do, and quite creatively. While I think the proposal should be rejected, I commend her work. The BOS direction to her follows from some of the arguments expressed here: “Government shouldn’t do anything except as a last resort.” “The transfer station should be self-supporting.” “Run government like a business.” “People shouldn’t pay for a town service that they choose not to use.” “People should only pay for those PARTS of a service that they use.” This is the same argument that says if you have no kids (or are a business), you shouldn’t pay taxes for the schools. And if you do and you choose to send them to a private school, the town should provide you with a voucher with which to pay the bill. Then say the schools are in trouble and charge “activity fees” for music, sports and clubs. We didn’t choose to live in that kind of town. When I came here, stickers were free – and there even was garbage (not trash) pickup – by a town-paid contractor. The schools had music, sports and clubs. And schools and services are what justify property values. We do have problems, but they’re not caused by wild irresponsible spending. There is some “I want services but I don’t want to pay for them, especially with taxes.” But primarily they are caused by external factors: demographics, health care, pensions, unfunded mandates and a general effort to shift costs from Federal and State government budgets to cities and towns. This may increase accountability. (If people would vote, show up at Town Meeting and run for the newly expanded BOS…) But it eliminates efficiencies of scale and consistency and shifts tax costs from income-based to property-based. Some find that reasonable; others don’t. I’m still shocked that despite the intensity of the discussion here, 94.5% of the town didn’t take 10 minutes to vote in the town election that changed our form of government. The $44K in “savings” that precipitated this proposal is 0.001% of the town budget. The total cost of the transfer station (no sticker fees) is 1.13% of the town budget. Of the total cost, 46% is disposal costs that could be reduced by increased recycling. Because the town doesn’t pay for disposing of recyclables, a much more responsible way to reduce transfer station costs would be to figure out how to get more people to recycle more. How many in this discussion would be willing to volunteer at the transfer station or in the schools to do this? Mention to people who drive up to the compactor with nothing to recycle that it’s costing the town money. See an earlier post for other ideas. But it’s still not a material item in the budget. I hope that when this issue is settled, we’ll recycle some of the energy that’s been found for this discussion into the big budget issues. Would a state-wide collaborative of municipalities be able to negotiate better health insurance rates? Should we share Police/Fire with neighboring communities? What are we going to do about the court case we just lost with Northborough? Should we be advertising/encouraging the use of town facilities by other groups after hours to raise money? How can we better support our selectmen’s lobbying against unfunded mandates and for state aid and grants that benefit our town? What can we do to involve the business community? Do we vote for congress/state reps who promise to “cut taxes”, “balance the budget”, “get more for Southborough” and “shrink government” by shifting costs to the localities? Or do we actually set priorities, reward honesty and hold them to the same standard as people expect in the discussion about the 0.001% issue that’s generated so much discussion here? This tree is getting a lot of attention, mostly because it’s a service that touches people directly and often. But let’s not forget the forest. 1. Cutting operating hours from 8-6 to 9-5 and opening only 3 days instead of 4. I guess if working people can’t get there on a Saturday, they are stuck with trash for an extra week. 2. CLOSING THE SWAP SHOP from Nov 1st to April 14th! 3. Paying and extra $25 to buy your stickers in person at the DPW. What is the justification for this? I would love to buy them online but I can never get the transaction to process correctly for 2 stickers. 4. “BULK” Fees – including $10 per stackable plastic chair. It doesn’t even cost that much to buy one of those. It does appear they are trying to crack down on commercial waste, which is a good thing, but in general, pardon the pun, this proposal stinks. There seems to be a consensus that commercial businesses use the Transfer Station unimpeded. Why hasn’t the town cracked down on this? It seems to be a no-brainer.